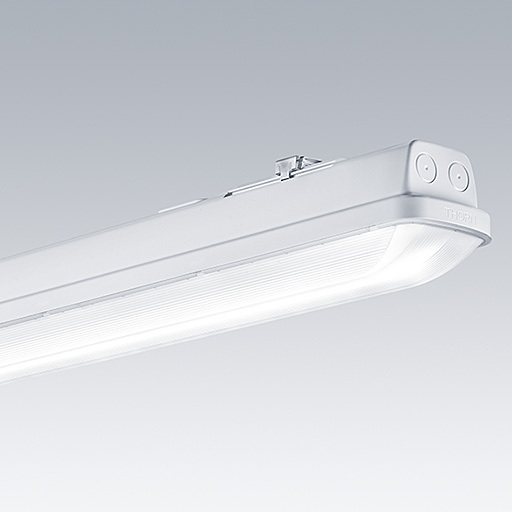 An IP66, dust and moisture resistant LED luminaire. Electronic, fixed output control gear. With medium beam distribution. Class I electrical. Canopy: light grey polycarbonate. Diffuser: high transmission opal polycarbonate with refraction prisms. Patented snap-on mechanism EasyClick for clipless mounting of diffuser. For surface or suspended mounting. Quick-fix brackets supplied for surface mounting. Suitable for ceiling or wall (both vertically and horizontally). Mounting kits for conduit, chain suspension and catenary suspension are available as accessories. Suitable for through wiring with H05VV or NYM cable (rated 10A). Integral presence detector for dimming control (corridor function). -20. Complete with 4000K LED.. Note: please contact your consultant if you are planning to use the luminaire in environments with chemical pollutants, high or condensing humidity and major variations in temperature.